Another charming maple that is not only beautiful but trouble-free and of a size that most gardens can accommodate. It is Acer buergeranum, or the Trident maple, and is native to Japan. It has beautiful, 3-inch-wide, deciduous leaves, tri-lobed, glossy green above and pale beneath. 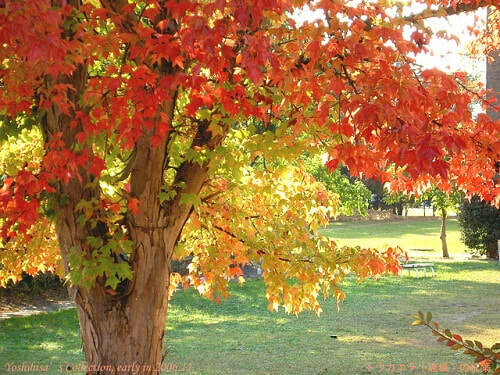 Whilst pretty in spring and summer, its autumn when they turn brilliant shades of red, orange, and yellow. But the Trident Maple even has a pretty floral display in spring with small, bright yellow flowers. A small to medium size tree that is naturally multi-stemmed but, if preferred, it can be easily trained to a single trunk and limbed-up to make it branch higher, permitting traffic beneath the broad canopy. With maturity it develops an attractive orange-brown peeling bark that is quite beautiful and provides color to a dull, winter’s garden. This also makes the Trident maple a four-season interest tree. Acer buergerianum serves well as either a street tree or a courtyard tree since it will succeed in any restricted area. It even makes a superb Bonsai subject. With its easy maintenance, and year round appeal, it would be an asset to any garden. It is highly adaptable, taking sun or shade, acid or alkaline soil and it grows throughout most of North America including Lower and Coastal Canada, all of the UK, New Zealand and Australia.